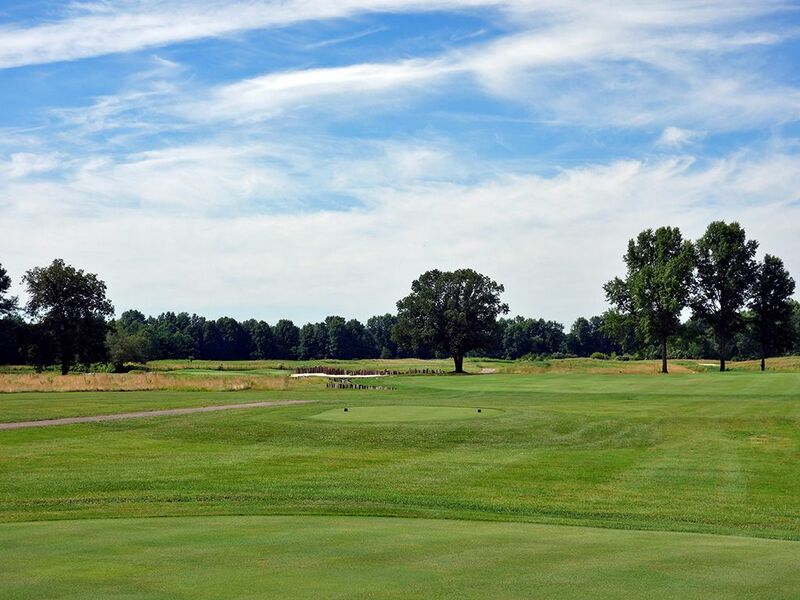 Accolades: Ranked 3rd in Ohio on Golf Course Gurus' Best in State list. 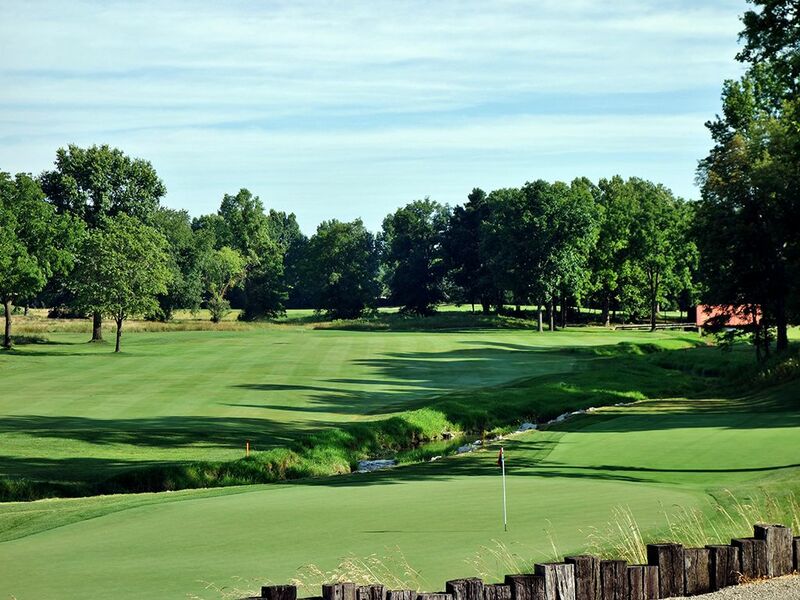 What to Expect: Don’t be fooled by the generic name, The Golf Club is one of America’s elite tracks. 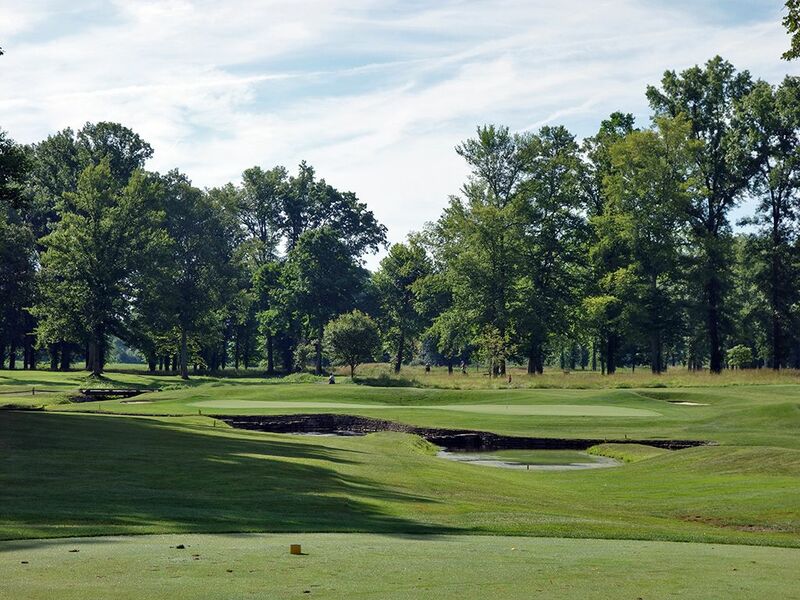 Located northeast of Columbus in the suburb of New Albany, The Golf Club is a Pete Dye design that will appeal to a much wider audience than many of Pete's designs that are often noted for their extreme features. 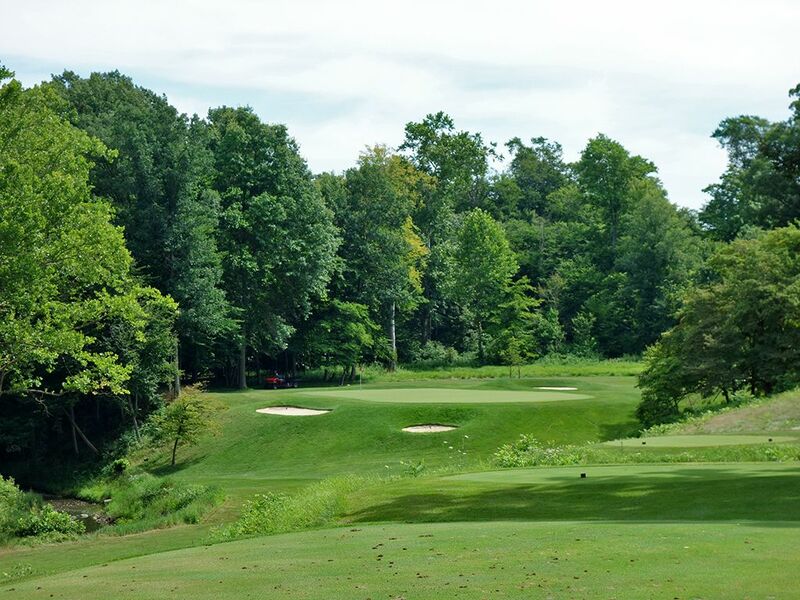 The men's only club isn't tricked up with overly quirky or penal traits, rather, it is a well conceived layout with holes running in multiple directions, lengths, and shapes which delivers excellent variety and enjoyment throughout. Enjoyment frankly isn't one of Dye's strengths, or desires, when carving out a course but The Golf Club does a great job of offering a enjoyable round while still testing a player in every aspect of their game. Ultimately you will still recognize The Golf Club as Pete's handiwork with signature features like the train box car located between the 5th and 6th holes, the tee boxes on the 14th shaped in the initials "pd", and the railroad ties found in some of the bunkers that all offer some character to the layout without taking anything away. One thing that players will notice early on is the near flawless conditioning throughout the course that is highlighted by perfect putting surfaces that roll as pure as anything you'll find; including Augusta National. The greens were redone in 2015 and the superintendent has capitalized on the opportunity by keeping them absolutely pure; the result of hard work and only 8,000 rounds a year. The terrain is relatively flat which is usually a bit of a downer in my book, but Pete managed to use the subtly moving ground to its maximum potential by creating hole shapes and designs that create impressive visuals, depth, and an engaging experience. There a plenty of trees on the property but enough were removed to offer a combination of seclusion yet moments of extensive vistas across the property. Speaking of property and seclusion, the club owns over 50 acres around the property to give it an extra sense of isolation which pairs nicely with the lack of housing to create a fantastic outdoor experience. 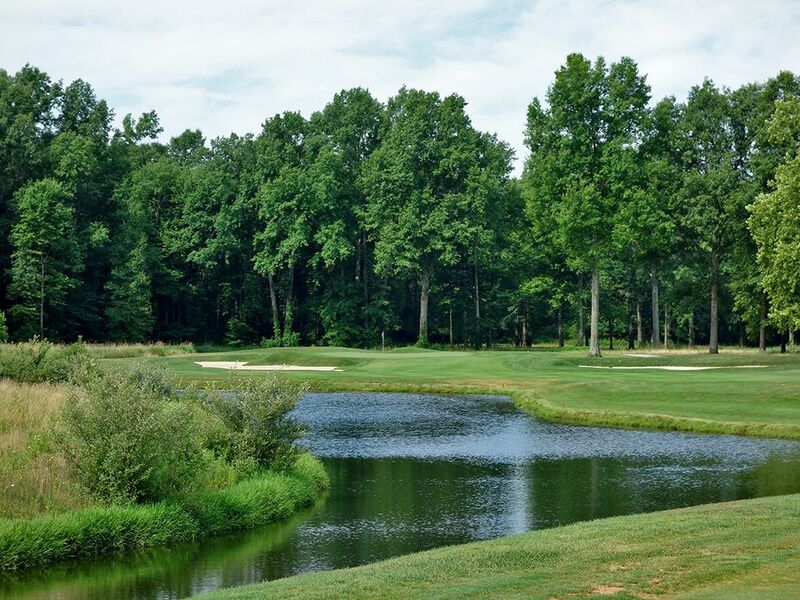 The finishing hole is one of the best in Ohio with an unassuming tee shot that sets up a heroic approach shot over the water to a green that shares its putting surface with the practice green. The club stays true to golf's early roots by asking players to walk and take a caddie for their round, but carts are available for those that may require them. As one other side note, the locker room is top shelf and has been recognized by both Golf magazine and Golf Digest as being in the top 10 finest offerings in the country. A 12 point stag is mounted on one wall while the north wall boasts a Cotswold stone fireplace with a 15 foot mantle. Above the mantle is a painting of founder Fred Jones who famously gave Jack Nicklaus his first job as an insurance salesman and is a legend in the area. 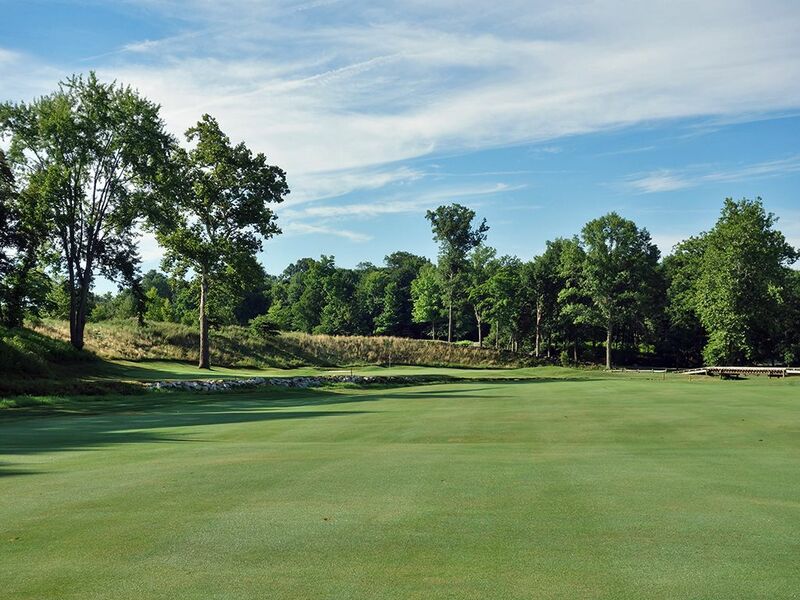 Bottom line, The Golf Club is a top tier golf course and experience that will be loved by fans, and detractors, of Pete Dye alike. 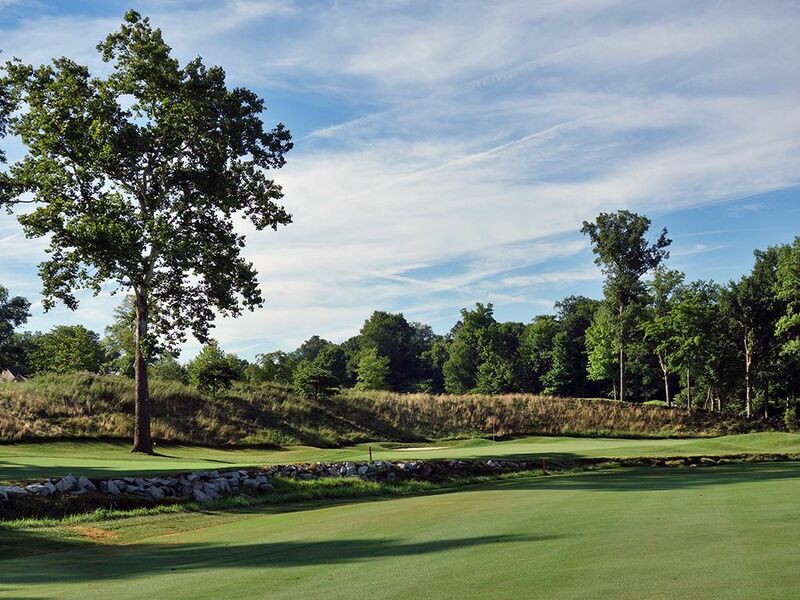 Signature Hole: 3rd Hole – 220 Yard Par 3 – It wouldn't be Pete Dye if there weren't railroad ties and a diabolical hole or two; well you get both of those elements on the signature 3rd. 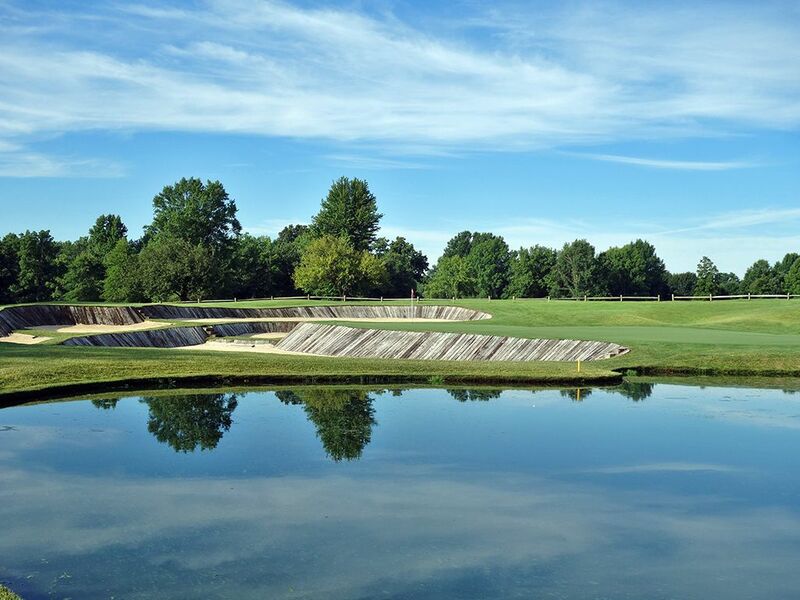 A gorgeous hole to behold, this long one-shotter is fronted by a pond and further defended by a large bunker that encompasses the left and back sides of the green. Railroad ties create the faces of the bunkering with a series of grassed walkways meandering through the sand for ease of navigation. A tee shot of 200+ yards is required to carry the water and reach the front edge of the green so it isn't a shot for those weary of heart, but a bailout area exists to the right should you need to utilize it. Beautiful and diabolical all rolled into one; if that isn't Pete Dye I don't know what is! Best Par 3: 16th Hole – 195 Yards – While the 3rd hole is clearly the highlight of the one-shotters at The Golf Club, the 16th is a simple, solid offering. The hole plays flat from tee to green with a deep pot bunker fronting the putting surface while additional bunkers are found front left and back right. The potato shaped green offers a fatter target in the front right third with a tighter landing area in the back left so your aggressiveness off the tee can be determined by the pin placement that day. With a steep slope and long grass in front, the miss is clearly long so if you are between clubs take the longer one and swing with confidence. Best Par 4: 13th Hole – 400 Yards – I love the creativity and options offered on the 13th hole. 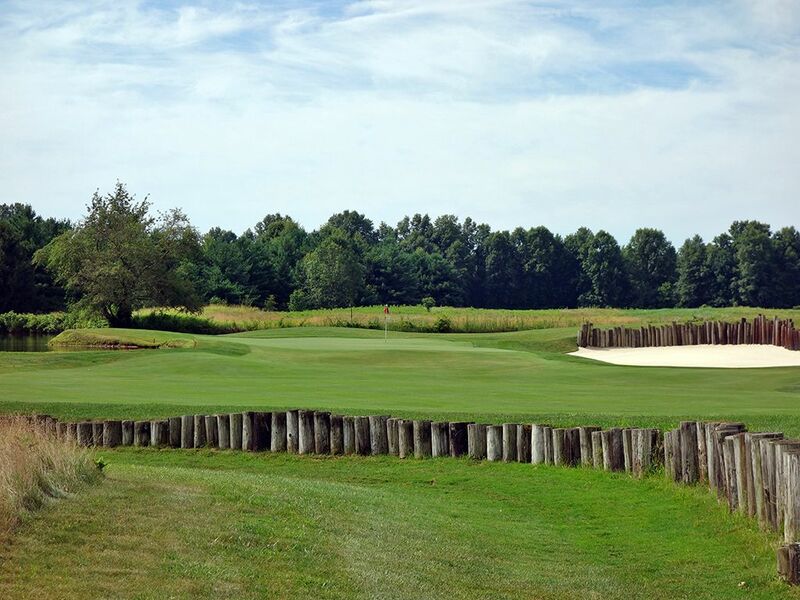 The hole plays straight south and features a left turn in the fairway about 270 yards from the back tee. A tee shot of that length is perfect for opening up the angle to the green while bold players may try to carry the junk left of the fairway that is separated from the short grass with a series of short logs that also act as the retaining wall of the back bunker. Water surrounds the left and back sides of the green while a large bunker on the right completes the peninsula of trouble guarding the putting surface and puts a premium on accuracy with your iron game. The bolder you are with your line off the tee the greater your chance of carding a birding, but a poor drive brings bogey into play quickly. Best Par 5: 14th Hole – 631 Yards – A true three shot hole, the lengthy 14th tests every aspect of your game. The tee shot features a huge bunker on the right side that will take 300 yards to carry from the back tee while ample fairway is afforded left of the sand to play to. On the second shot players have to decide how aggressive to get as the fairway narrows and is pinched by a pond on the left. Left continues to be trouble on your approach shot to the green as that side is encased by sand the full length of the putting surface. This is a methodical hole where you won't find a lot of reward for getting too bold with the lines you take or lengths you hit, so play this hole smart. Birdie Time: 8th Hole – 148 Yard Par 3 – While water fronts this green, all you should be worried about is sticking one tight to wherever the pin is. The kidney shaped green opens up on the left side to provide a bigger target, but with a low iron in your hand and a perfect lie, you should take dead aim at any hole location. With no driveable par fours and relatively lengthy par fives on the course, this is your best chance to take a stroke back from Old Man Par. Bogey Beware: 6th Hole – 470 Yard Par 4 – The 6th is just a good golf hole and a better test. 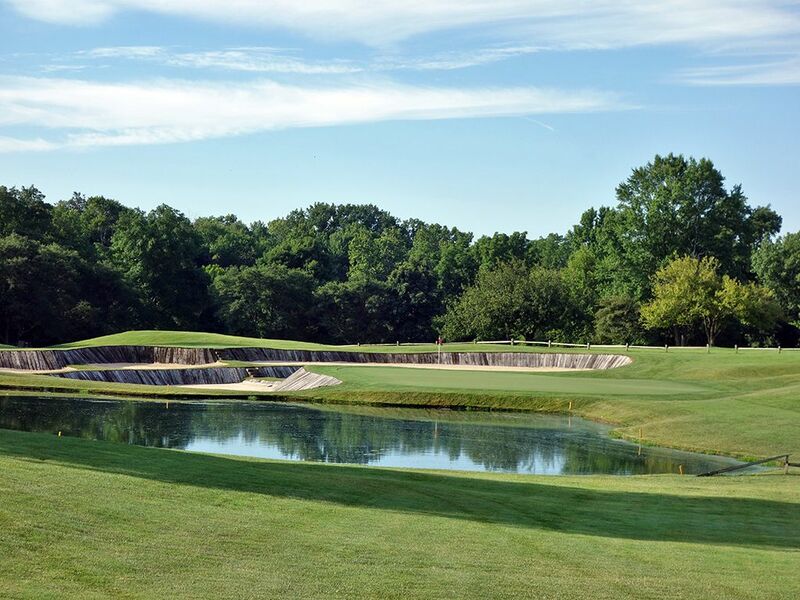 At 470 yards it is the second longest par four on the course. 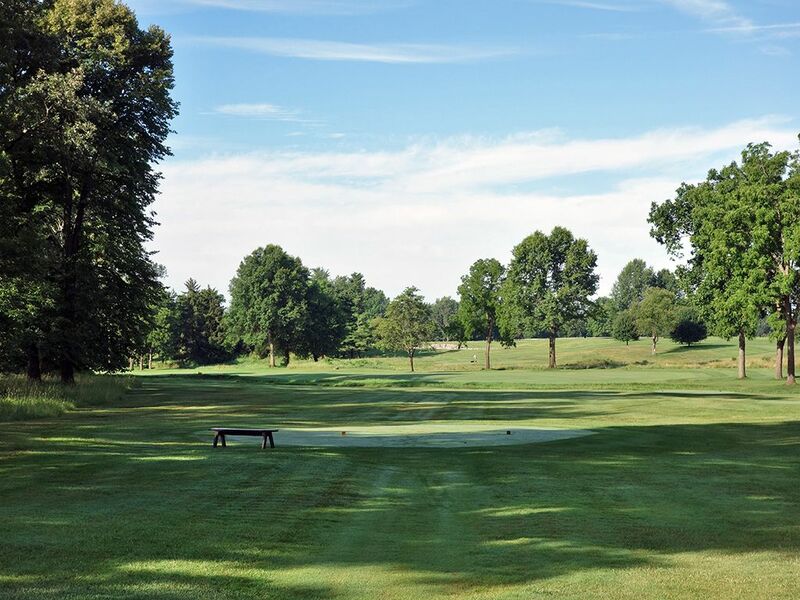 This dogleg left features a creek that crosses the fairway and runs up the left side before carving back in front of the green to create a long carry on player's approach shots. 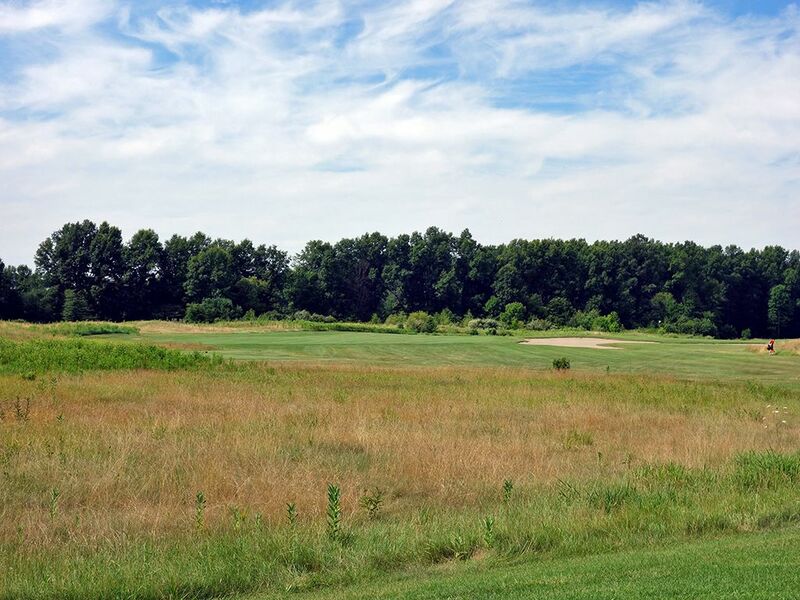 A 300 yard drive up the right side of the fairway will bring trees and some long fescue grass into play so you'll either need to draw the ball around the corner or make sure you hit something short of the far side of the fairway. More concerning though is the approach shot to a skinny green over a creek that is best attacked from the left side of the fairway to open up the depth of the putting surface. If your confidence is waning then it may not be a bad idea to layup short of the water and put your short game skills to the test or at least minimize the damage to a bogey.